How to Extract All Attachments from Email Messages; In this simple solution, I cover one way to easily extract all attachments from your Outlook, Outlook Express, Windows Live Mail messages. 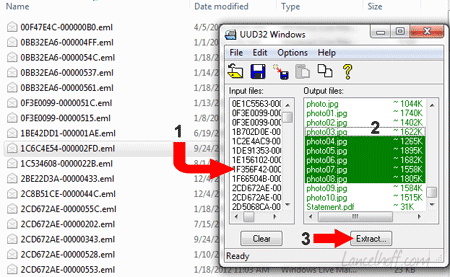 For this process, we will be using a Free Email Attachment Extractor called UUDWIN, created by Mark Spankus. This tool might be used to batch extract attachments from email .eml, .pst, and, .msg files. (1) Drag and drop your .eml, .pst, .msg files into the input files window (2) Select attachments to save from the output window (3) Click Extract and save the attachments to the folder of your choice.